As we noted in our 6 scary home pollutants to avoid post, formaldehyde is a big bad. Formaldehyde, a colorless, but pungent-smelling gas is used in all sorts of toys, such as pressed wood or plywood dollhouses and play kitchen sets. Not cool since formaldehyde is linked to numerous health problems, including cancer. That said, if your child's dream gift is a play kitchen set, and you want to avoid formaldehyde, you're left with just a few expensive choices. Most solid wood kitchens cost an arm and a leg; often $500+. But, if they're not expensive, there's a good chance they contain formaldehyde. What to do? Luckily, the gorgeous play kitchen sets from Heartwood Natural Toys won't completely break the bank, yet are still ultra safe for your child. 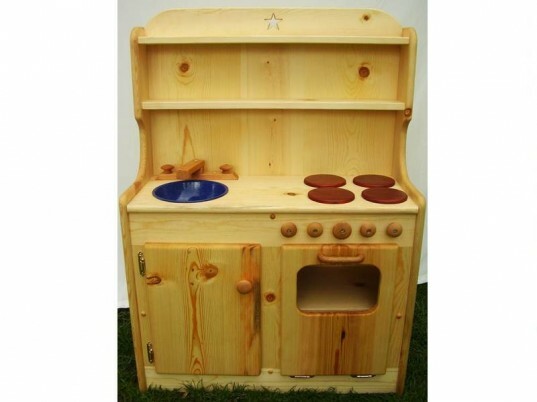 Take the sweet little Heartwood Natural Toys Wooden Play Kitchen II. At under $250 it’s a steal for features included and you can’t beat the quality. This is an inexpensive, heirloom-quality gift that will last for generations. The kitchen is small but awesome, made with great surface space to play including four burners and a wonderful blue enamel or stainless steel sink (your choice). The realistic faucet is made with black walnut or poplar and the oven provides plenty of room to cook. A nice under cupboard area is perfect for storing pots and pan or could even become a pretend fridge. As a bonus for parents, this kitchen comes fully assembled. 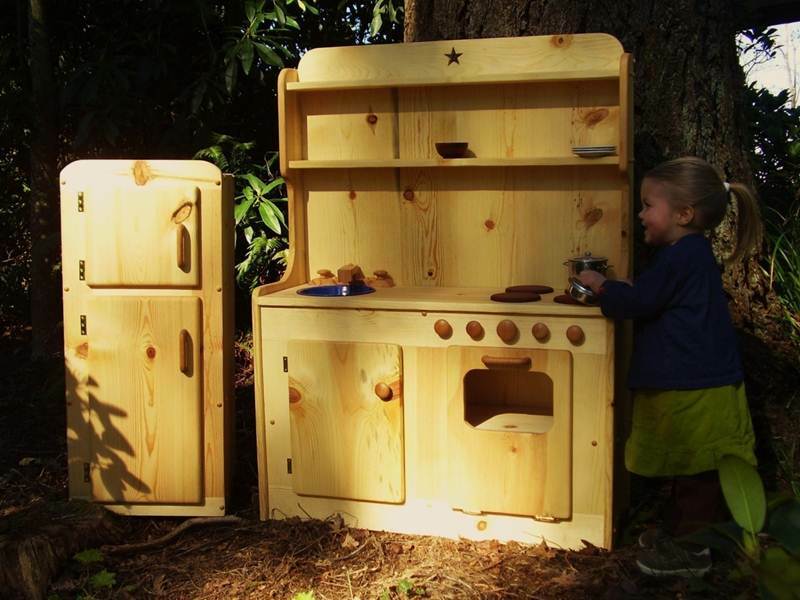 Heartwood Natural Toys hand builds their wonderful play kitchen sets eco-friendly for your child, with real wood. 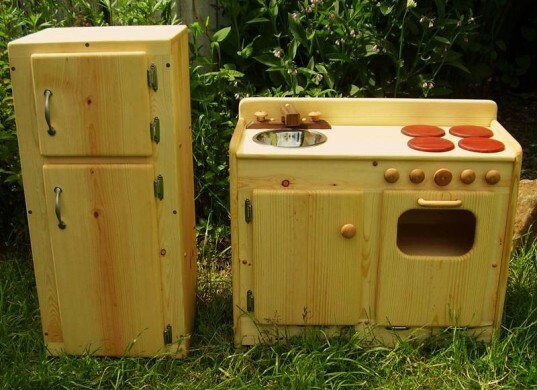 Kitchens are made without harmful plywood (zero formaldehyde, without toxic paints, without plastic parts and each toy is finished with healthy, non-toxic linseed oil. Even the glue used for these kitchens is non-toxic. The cute Waldorf Carry Along Stove Top play set offers big fun in a smaller, less expensive package. So long as you have a sturdy table to set it upon, this kitchen will be a hit. You can even set it right on the ground for very young tots. This Carry Along Stove is light and portable so it can be taken to a friend’s home or simply moved room to room. Made of solid pine with hardwood paduak burners, and finished with non-toxic linseed oil. The cute knobs really turn for realistic play. Beyond the eco-aspects of this family-run business, safety is also priority. 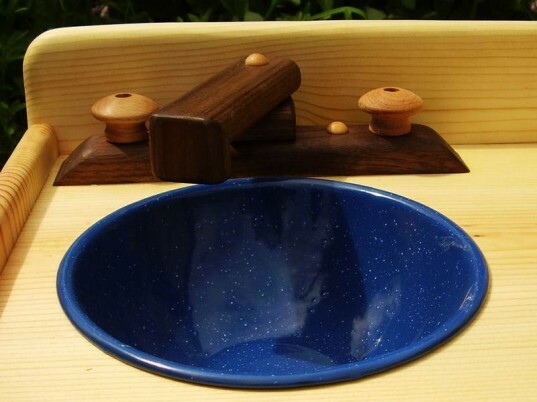 The builder counter sinks every screw and plugs all screw holes with pine buttons or oak plugs. All kitchen corners are rounded over and sanded velvety smooth. All knobs and faucet turn & move so your child can experience realistic play, but are safely attached with bolts and lock nuts so they will not come loose. Even a lush kitchen set from Heartwood Natural Toys won’t set your budget back too far. For less than $200, you can add a stylish fridge to your child’s kitchen set. The playful fridge is made with solid pine and three hefty shelves to hold play food galore. Of course, the fridge is also made with the same care and quality as the other kitchen sets. So, if your child is dreaming dreams of a super sweet play kitchen set this holiday season, a visit to Heartwood Natural Toys is a must. This company understands that parents want quality, but don’t always have oodles of cash to spare. Also, Heartwood Natural Toys is willing to discuss custom orders if you have something unique in mind. 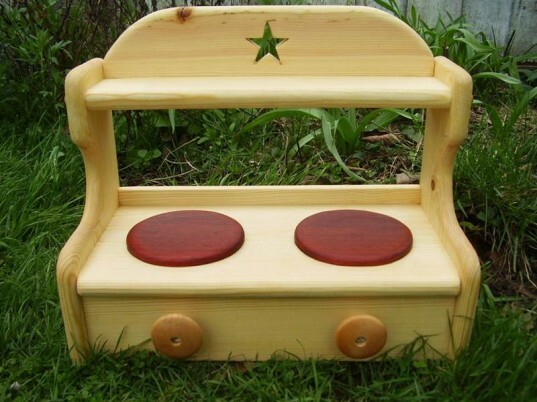 Hi Carol- Please contact Heartwood Natural Toys directly with your request. Thanks! Hey I was wanting to check on your products at the top the stove and fridge combo how much does it run and how big are they. Im looking to buy my 3 year old a birthday present for her playhouse thank you. 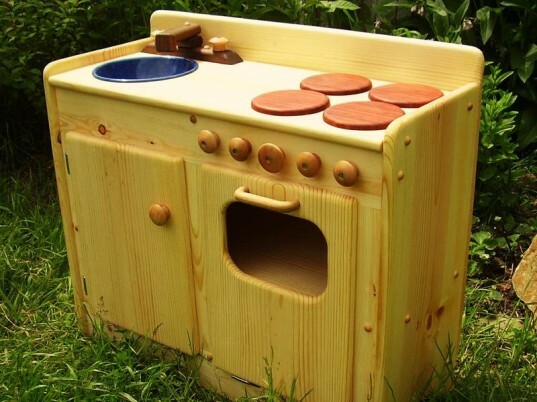 Take the sweet little Heartwood Natural Toys Wooden Play Kitchen II. At under $250 it's a steal for features included and you can't beat the quality. This is an inexpensive, heirloom-quality gift that will last for generations. The kitchen is small but awesome, made with great surface space to play including four burners and a wonderful blue enamel or stainless steel sink (your choice). The realistic faucet is made with black walnut or poplar and the oven provides plenty of room to cook. A nice under cupboard area is perfect for storing pots and pan or could even become a pretend fridge. As a bonus for parents, this kitchen comes fully assembled. The cute Waldorf Carry Along Stove Top play set offers big fun in a smaller, less expensive package. So long as you have a sturdy table to set it upon, this kitchen will be a hit. You can even set it right on the ground for very young tots. This Carry Along Stove is light and portable so it can be taken to a friend's home or simply moved room to room. Made of solid pine with hardwood paduak burners, and finished with non-toxic linseed oil. The cute knobs really turn for realistic play. 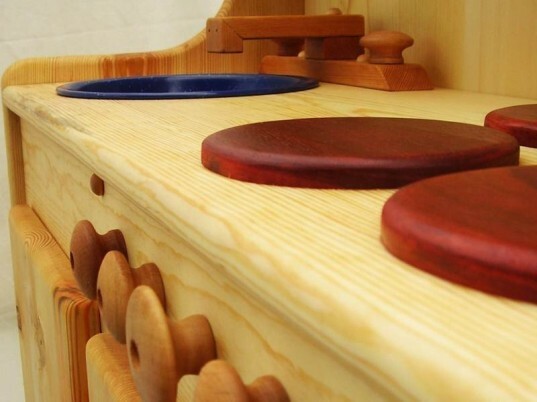 Even a lush kitchen set from Heartwood Natural Toys won't set your budget back too far. For less than $200, you can add a stylish fridge to your child's kitchen set. The playful fridge is made with solid pine and three hefty shelves to hold play food galore. Of course, the fridge is also made with the same care and quality as the other kitchen sets. So, if your child is dreaming dreams of a super sweet play kitchen set this holiday season, a visit to Heartwood Natural Toys is a must. This company understands that parents want quality, but don't always have oodles of cash to spare. Also, Heartwood Natural Toys is willing to discuss custom orders if you have something unique in mind.